The ancient vedic scriptures inform us that the beautiful land of Vrindavan is non-different from the spritual world. Elsewhere is the vedas Lord krishna has also declared that he never leaves Vrindavan and is eternally present there ii his transcedental sprititual form. Therefore to reside in Vrindavan is exactly same as residing within the spritual world, and thereby directly associating with the supreme personality of Godhead Lord Sri Krishna. Five thousand years ago when the supreme Lord in his original form as Krishna advented himself here on earth, this part of the world was ruled by the most cruel and sinful king Kansa had imprisoned his own father, Ugrasen, and usurped the throne of Mathura. With the help of other sinful and irreligious kings and his demoniac friends, Kansa let loose a terrible reign of terror. "To deliver the pious and to annihilate the miscreants, as well as to reestablish the principles of religion, I myself appear, millennium after millennium." When the Supreme Personality of Godhead Lord Krishna descends to earth for performing his transcendental pastimes, he brings with him his own eternal abode known as Goloka Vrindavan, along with his most intimate associates friends, servants, and various other transcendetal paraphenalia. Just like a king who goes to another country takes with him his personal friends, family members, ministers and secrataries, as a part of his rayal retinue. The Lord's transcendentalÂ abode which is also known dhama, is non-different from the Lord's eternal abode in the spritual world, in fact it is an excat replica. By mundane material vision the dhama amy appear like any other place on earth, but to the pure devotees and perfect yogis, the dhama is completely spritual and abode saturated with it's own transcendental surcharged atmosphere. In the year 1516, the two brothers Rupa and Sanatana Gosvamis were ordered by Lord Chaitanya to go and live in Vrindavan and search out all the holy places connected with Lord Krishna's transcendental pastimes. When they first came to Vrindavan it was just large forest, and at night they would sleep under the trees. They dressed only in simple kaupins(loincloths) and subsisted on forest roots dry chapatis obtained by begging alms.These Gosvamis brothers hardly slept for 2 hours a day and spent most of their time in meditation and compiling books on the science of Bhakti-yoga. Some of their works, written on parchment leaves have been preserved and can be seen at the Vrindavan Research Institute. The fame of Lord Chaitanya and his followers spread so far and wide that even Emperor Akbar decided to pay a visit to Vrindavan in the year 1570. Jiva gosvami led him blindfolded into the sacred kunj of Nidhivana. So great was the emperor experience there, that to commemorate the event, he granted permission to construct four grand temples dedicated to Lord Krishna. The temples were Govindaji, Gopinatha, Madan-Mohan and Jugal-Kishore. The emperor aslo donated funds to setup a library for the preservation of Gosvami's books at Radha-Damodar temple. This library used to be in the room to the left of the altar and is still known as grantha-ghar(book house). Unfortunately, one hundred years later,these same temples were descrated by the soldier Emperor Aurangzeb, the muslim zealot,in the year 1670. 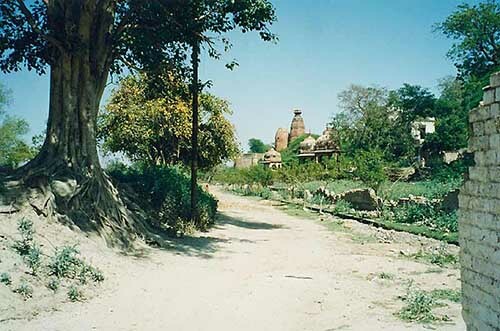 It was in the year 1515 that Lord Chaitanya Mahaprabhu visited Vrindavan, with the purpose of locating the lost holy palces associated with the Lord Sri Krishna's transcendental pastimes.Lord Chaitanya wandered through the different sacred forest of Vrindavan in a spritual trance of divine love, somtimes laughing sometimes crying, sometimes dancing in ecstacy and chanting the holy names of Krishna. By his divine spritual power, he was able to locate all the important palces of Lord Krishna's pastimes in and all around Vrindavan. When Lord Chaitanya first arrived un Braj, he stayed at Brahmana's house on amthura and would walk around Vrindavan every day visiting the sacred palces connected with Lord Krsihna's pastimes. Later Lord Chaitanya move d his residence to Akrura Ghataand would daily visit imli-tala, where he sat looking at the river yamuna while cjanting Hare Krishna in his japa beads and constantly shedding tears ina n ecstatic mod of divine love. 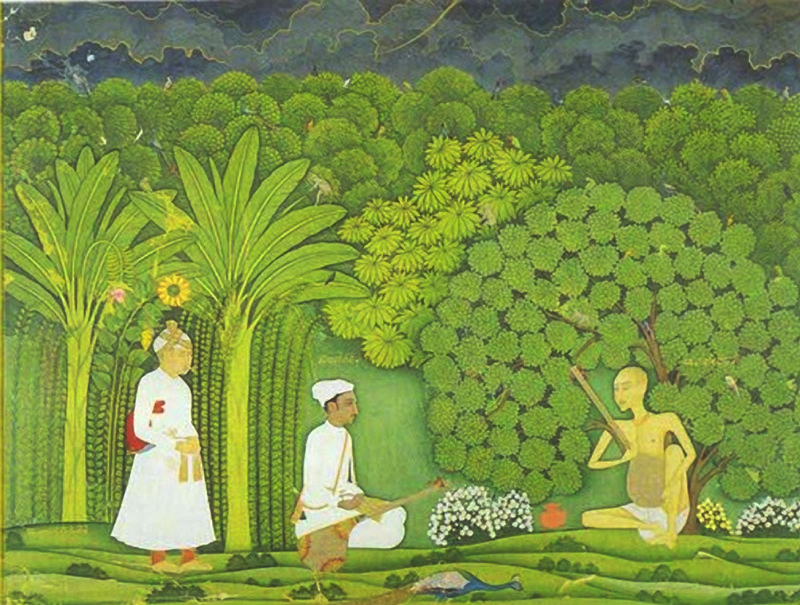 After a few months, Lord Chaitanya left for jagannatha puri and directed two of his dear msot followers, Rupa and Sanatana Gosvamis to proceed immidiately to Vrindavan, not only to excavate the palces of Lord Krishna's pastimes but also to write books on the science of Bhakti-yoga, in order to establish the teaching of Lord chaitanya for the benefit of all future generations. !! HARE KRISHNA HARE KRISHNA KRISHNA KRISHNA HARE HARE !! !! HARE RAMA HARE RAMA RAMA RAMA HARE HARE !! !! HARE KRISHNA HARE KRISHNA KRISHNA KRISHNA HARE HARE !! HARE RAMA HARE RAMA RAMA RAMA HARE HARE ! !